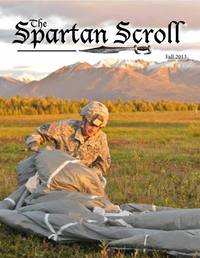 The Spartan Scroll is compiled and produced by the 4th Infantry Brigade Combat Team (Airborne), 25th Infantry Division's Public Affairs Team. 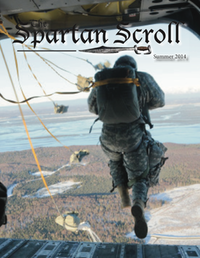 It is a bi-annual publication filed electronically and made available specifically for the paratroopers and their families; highlighting the hard work, sacrifice and dedication our Spartan Paratroopers demonstrate each day. All content is reviewed for accuracy, brevity and style before publication. All questions should be forwarded to the 4-25 IBCT (ABN) Public Affairs Office.